An oil that contains a special herbal blend that reduces acidic formulation in the body and relieve tension. The oil increases circulation, detoxifies, and reduces swelling and aches. An effective relief for arthritis and stiff joints. Especially selected Icelandic herbs and essential oils were blended for this purpose. A long study and research has been made in favor of may people suffering from painful joints. This oil can and may be used as often as necessary. Purity Herbs recommends this oil should be used a log with Shark Cream. Herbal Extracts: Angelica archangelica, Articum lappa, Dioscera villosa, Salix alba, Spiraea ulmaria, Cetraria islandica, Glycyrrhiza glabra, Harpagophytum procumbens, Juniperus communis, Symphytum officinale, Taraxacum officinale, Thymus serpyllum, Hypericum perforatum, Capsicum Frutescens oleoresine. Essential Oils: Junipers communis, Cinnamomum camphora, Citrus medica limonum, Thymis vulgaris, Rosmarinus officinalis, Myristica fragrans, Piper nigram, Pelargonium graveolens, Eucalypts globulus, Citrus aurantifolia. Devils claw (Harpagophytum procumbens) – is known to have a strong influence on stiff and painful joints. 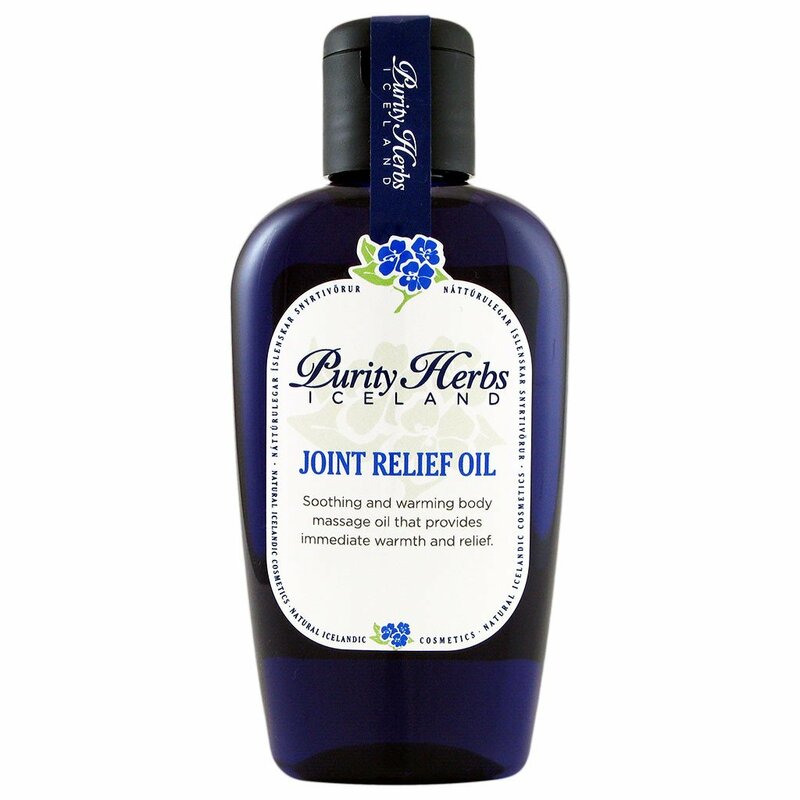 Reduces swelling, calming, good on arthritis. Licorice (Gkycyrrhiza glabra) – reduces swelling, acid and is anti-inflammatory, very useful on gout and arthritis. White wallow (Salix alba) – contains salicylic compounds, which is a painkiller and disinfecting agent. This herb is very healing and is used in preparations for cuts, skin ulcers, and burns. Meadow sweet (Spiraea Ulmaria) – It has the reputation of being a natural painkiller in the treatment of arthritis and has anti-inflammatory properties.